"Emotional Equations: How to Master Your Emotions in Work & Life". "Identity Theft" presented by The Federal Bureau of Investigation. Valet: $12 for 3 hours. Self-parking: $8 for 3 hours. Details to follow. Celebrating the end of our 2011-2012 HFTP-LA season! Current State of the Industry and Preliminary 2013 Forecast. Self Parking at Pershing Square is $7.00. Valet is $22.00. Human Resource Issues and Laws. Todd Seiders, Director of Risk Managment at Petra Risk Solutions. Holiday Celebration & Silent Auction! 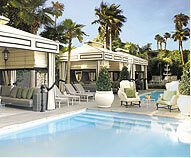 Our celebration will be held at the Loews Santa Monica Beach Hotel. Enjoy breathtaking views of the Santa Monica Pier and Pacific Ocean from this beachfront hideaway!